Earlier this week, a little bit of auction history was made when the first ever evening sale of Indian art was held in New York. (An evening sale is infinitely more posh than a regular auction. It’s as much an event as it is a sale.) Sotheby’s presented 43 works from collector Amrita Jhaveri’s Amaya collection of modern and contemporary Indian art and raised a little less than $7 million dollars. Some of the proceeds from the sale are going to Khoj, to fund a project space and lecture room, and this is truly heartwarming because Khoj has been critically important for Indian contemporary art. Much of the cool, funky and experimental stuff that charm us today wouldn’t have been possible without Khoj encouraging the artists and practices that it does. So it’s really good to hear of earnings from Indian art being channelled back into Indian art. Amrita had very kindly asked me to write for the catalogue that was put together for The Amaya Collection evening sale and it’s a beautiful publication. The catalogue has essays by Yashodhara Dalmia, Malcolm Cossons, Girish Shahane and yours truly. I do think my piece has an unfair advantage though: a lovely black and white photo by Dayanita Singh of Amrita with her father. This article originally came out in Wallpaper*. Be warned: it’s long. 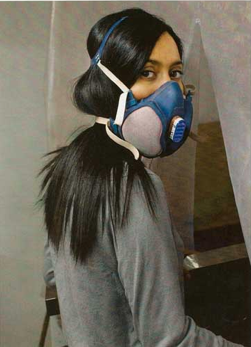 Love this photo that Wallpaper* shot of Rana. Artist Rana Begum’s father migrated to England in 1985 from an obscure village in Bangladesh because he wanted his family to have a better life, one unmarked by hardship. When he now sees his daughter doing hard labour to make a living, it bewilders him. “To this day, he says: ‘Why are you doing this? This is not what women do. Using machines and working with metal, cutting wood and stuff, this is not what girls do’,” chuckles Begum. “He’s like, ‘Look at you, you’re so exhausted and you look so tired. It’s not good for you.’ And I have to tell him that actually it is good for me, it makes me happy. My parents are puzzled really that I can have a career and make money and make a living from this and survive.” By ‘this’, Begum means art. Begum belongs to a new recent of British Asians that have resisted the parental push toward conventional professions with steady and considerable salaries. Begum’s decision to become an artist seems particularly unconventional when you keep in mind that she grew up in a Muslim household. Iconography is anathema to Islam and this has, over centuries, developed into a rigid mistrust of figurative art in particular. Begum was very aware of this while growing up. “Through my GCSEs and A levels, I really did like representational art and I couldn’t understand abstract art at all,” said Begum. “I was a figurative artist to start off with and everything I did, I used to hide it under the bed because I couldn’t show it to them [her parents].” She found her connection with abstract art in the mid-1990s, while studying for a foundation course in art and design. She realised then that the figure didn’t actually interest her; colour, form and lines did. It wasn’t until the early 2000s, when she met her partner, sculptor Nathaniel Rackowe, that Begum developed her distinctive artistic language. Rackowe and Begum were both students in Slade School of Fine Art where Begum specialised in painting. The two met through a part-time job. “I’d always been fascinated by sculpture but I think I was also afraid of it,” said Begum. “Seeing how Nathaniel works and makes his work gave me more and more confidence to push my work and take that leap.” Today, Begum’s art is an intriguing hybrid of painting, sculpture and installations. Made up of bold lines and solid shapes, her works are minimalist and striking for her use of geometry and colour. Curiously, there is a subtle synergy between Begum’s distinctive visual language and certain basic principles of religious Islamic art. The emphatic geometry of her style, with the attention to straight lines and precise angles, shares a connection with fundamental components of the beautiful and elaborate decorations seen in mosques. Drawn with meticulous accuracy, the geometric elements of religious Islamic art represent perfection and purity. The repetition of these shapes and lines creates patterns that could theoretically be expanded endlessly. This is because they express the idea of the one god being infinite and the earthly world being part of a larger, divine universe. The infinite and the sublime are concepts that are strongly present in Begum’s work and even though she approaches them from a decidedly secular perspective, Begum readily counts traditional Islamic art as a major influence. One of her most memorable experiences was visiting the Cathedral-Mosque in Cordoba in 2007 and seeing its famous arches. “It was so beautiful and just so amazing in the way the simple form and shape can be repeated to create a space like that,” recalled Begum. “I was there and I was like, this is what I want my work to feel like.” In stark contrast to this strongly Islamic tradition are the other influences that Begum lists: the work of modern artists like Sol LeWitt, sculptor Donald Judd and painter Agnes Martin. The impact of these artists’ use of grids and solid colours and their manipulation of materials is obvious in Begum’s work. Her immediate inspiration, however, is the city. In Begum’s art are intriguing representations of urban sights. Architectural planes, safety jackets of construction workers, road markings, the geometry of signage – such are the visual images that Begum abstracts to create her work. An awkward clash of colours glimpsed in signs or the unexpectedly elegant alignment of shapes in everyday objects like fences or barricades is stripped down to its basics to reveal a pristine abstract. Begum’s favoured materials include paper and extruded aluminium. She’s also used coloured adhesive tapes in the past. “I’ve always been fascinated by how much you can push a material, in terms of perfecting it to its best quality and getting something unexpected, something sublime out of it,”says Begum. In Begum’s hands, paper appears more dense and solid while aluminium loses its metallic quality and seems malleable enough for origami. Frequently, her starting point is something she spots while walking down a London street. Through her sculptural pieces, Begum tries to recreate what she’s seen in a way that lets the viewer see it from different angles. Her works tend to adapt to the space in which they’re displayed, revealing new layers and aspects. In many of her works, there are revelations for the viewer. See it from one angle, and it looks like a flat, monochrome block. Shift a little, and colours, shadows and dimensions emerge. It’s like watching a piece shed its skin to reveal an entirely new creation. “When I realised that the viewer doesn’t have to be in one position to view the work, it was a really exciting moment for me,” said Begum. “It meant that it’s not going to allow the viewer to get bored with the work. It meant that the viewer can actually discover something new every time they walk around the work.” Begum experienced that sense of discovery herself when she saw one of her works in a client’s house, bathed in natural light. Since her studio has no natural light, Begum was transfixed by the sight of her creation becoming something new with every shift of sunlight. Apart from urban, architectural geometry, Begum’s other great fascination is colour. She describes her practice as “an investigative process”, researching the interplay of form, angle and colour. For instance, the series of works she produced in 2009 for Third Line Gallery in Dubai explored the relationship between black and other colours. The credit for this theme goes to her son, Jibril, who was then a few months old. “I was doing loads of paper studies and each time I’d make these, I’d show them to Jibril and he would react to each one,” says Begum. 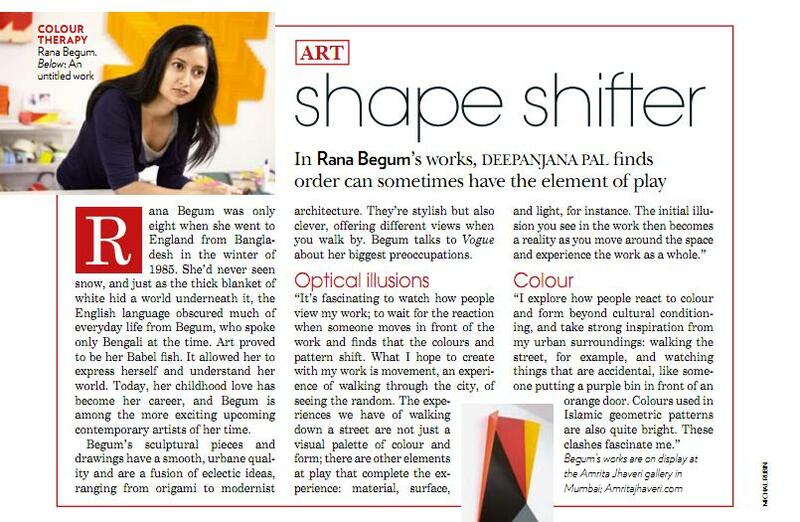 “His reaction to black and bright orange and green was really quite different from the rest.” Intrigued by this, Begum began working on a series that explored contrast. Instead of absorbing the brightness of other colours, black actually served to add to their vibrancy. This interview was first published in Vogue India.